Why do people die by suicide? Dr. Thomas Joiner and his colleagues attempt to answer this age-old question by exploring two obvious yet insightful assumptions: people die by suicide because they can - that is, they become desensitized to pain and habituated toward violence; people die by suicide because they want to - they typically have no sense of belonging to a valued group or relationship, and they feel that they have become a burden to loved ones.This book offers a new theoretical framework for diagnosis and risk-assessment of a patient's entry into the dark and obscure mental world of suicidality, and for the creation of preventive and public-health campaigns aimed at the disorder. 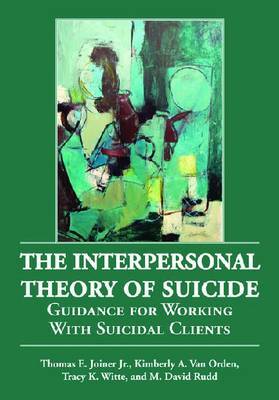 More important, though, the book provides new, effective clinical guidelines for crisis intervention and for therapeutic alliances in psychotherapy and suicide prevention.